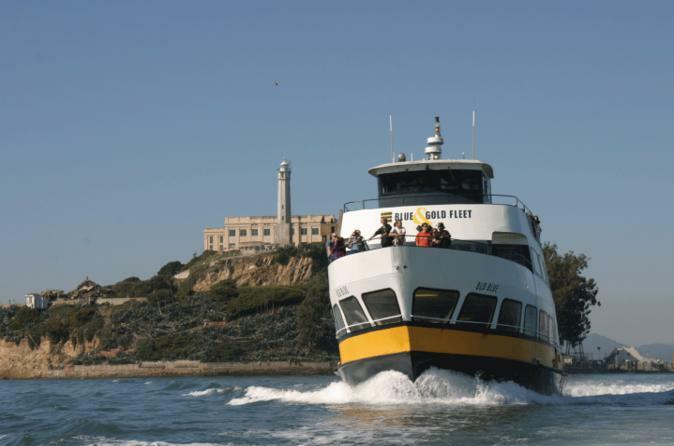 Embark on a 90-minute cruise along the San Francisco waterfront, under the Golden Gate Bridge and past Angel Island State Park before circling Alcatraz Island for an in-depth view of the prison. Take in the sights and sounds of the island as you listen to ex-guards and former inmates tell their stories of murder, mayhem, and mobsters on an audio tour with historical photos via your smartphone, tablet or other WiFi-enabled device. This ticket allows you to skip the box office line and go straight to the gate. This 1.5-hour 'Escape from the Rock' cruise, departing from Pier 39, takes you under the Golden Gate Bridge and around Alcatraz Island to see every angle of the former federal penitentiary, now part of the Golden Gate National Recreation Area. En route, enjoy sightings of the city skyline and Angel Island. A multi-language audio tour is available with WiFi-enabled devices, and food and drinks are available to purchase on board. Hear intriguing stories about Alcatraz escape attempts by Al Capone, Billy Cook the Killer, Clyde Johnson, and many others. You'll get a clear picture of what life was like in this maximum-security prison when it was the most feared institution in the American penal system.